Abstract: Airwheel is a high-tech and popular commuting vehicle among the public. To address the mobility problems for the weak and disabled, Airwheel rolled out H3S folding power chair, allowing them to enjoy greater peace-of-mind and independence, and receive premium support. As we know the human's trip modes have undergone several thousand years' development with more power modes. Now, we are living in the age of abundance and have more choices than ever. Airwheel mars rover is one of the emerging travel helper for the masses and its H3S automatic visual following wheelchair deals with the problem of traveling round of the old. Currently, the Airwheel H3S is the only chair that automatically opens and closes with the touch of a button. It folds into a compact size and is easy fold up to manageable size that can fit in the trunk of almost any car. Its total weight is about 33kg, which makes it super easy to lift when necessary. H3S folding electric wheelchair is easy to fold & extremely convenient for traveling in any type of vehicle whether it's a car, truck, SUV, taxi, bus, train or cruise ship. H3S is using rechargeable lithium ion battery which can achieve standard max. speed of 6km per hour. With its 12 inch rear flat free tires and high ground clearance, the Airwheel H3S can easily move over small bumps in the road and short grass. Also, its rear gear motor with dual drive provides powerful kinetic energy. What is more, H3S has its mobile app and riders can see the current speed, mileage and battery level on the main screen. Riders can change wallpapers of the app and set speed limit according to personal requirement. 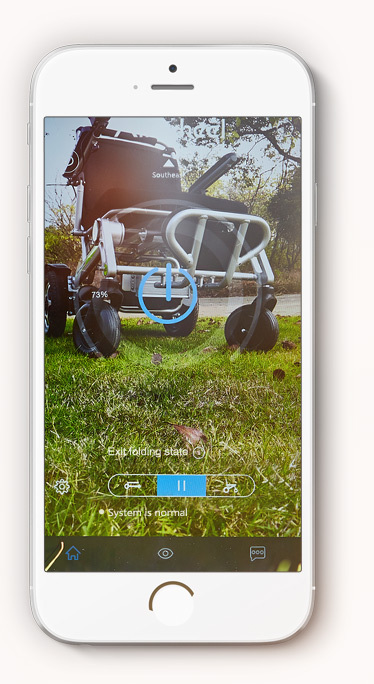 Use the mobile app to remotely drive Airwheel H3S electric wheelchair, lock/unlock to keep it secure, and choose a drive mode that's right for you. Also, they can control H3S remotely and let it follow rider automatically, because of the built-in camera. Looking for a travel chair that follows you and opens and folds with the touch of a button - Airwheel H3S is the power chair for you!